There were times when I had only PC’s at home, but at some point I switched to the Mac. After the Mac came the iPod followed by the iPhone and the iPad. I transitioned from .Mac to MobileMe to .Me and finally to iCloud, so I had all my contacts and calendars in iCloud. A few years ago I started using an Android smartphone and soon I had a problem to be solved! How can I easily sync iCloud contacts and calendars between my Macs / iOS devices and Android devices? Over the years I have been adding my contacts to Address Book (now called Contacts I believe) and I have been managing all that data using Address Book. I made sure all my contacts were filed correctly with their home and professional email, addresses and phone numbers. As long as you stay within the walled Apple garden, that is the way to go. Adding a contact on the Mac magically makes it appear on my iPhone a few minutes later thanks to iCloud. Changing the information on another device updates it on my iPhone and Mac as well. 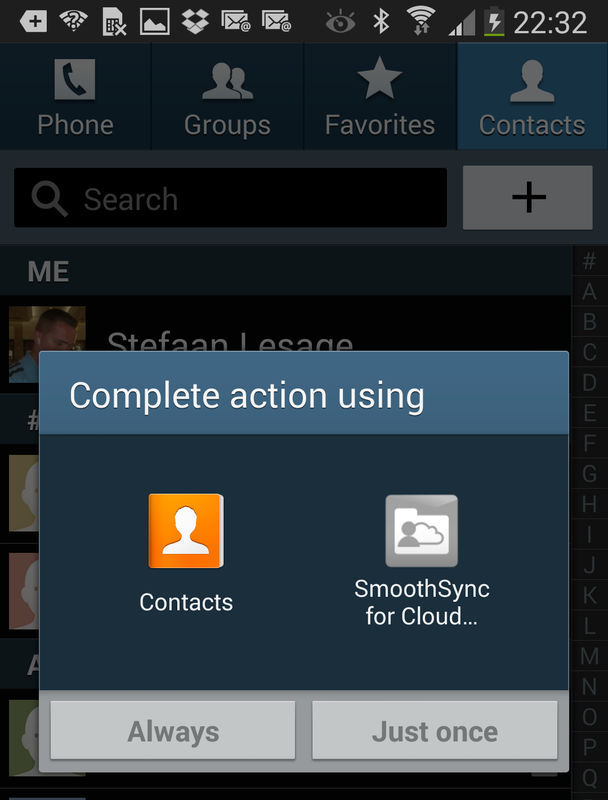 Smoothsync for Cloud Contacts to the Rescue! I wasn’t asking for a lot, just an easy way to get my iCloud contacts with Android devices was a good start. Even better would be if changes made on the Mac / iOS side would get propagated to the Android device. If it would also work the other way around, then I would be in heaven and no longer have an excuse not to try out the Android platform. 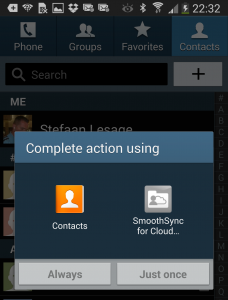 Once I bought Smoothsync for Cloud Contacts on the Google Play store it got installed on my Android device. 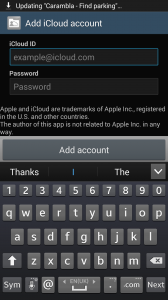 When starting up for the first time, the application asks you to enter your iCloud credentials and password in order to sync all your iCloud contacts to your Phone. 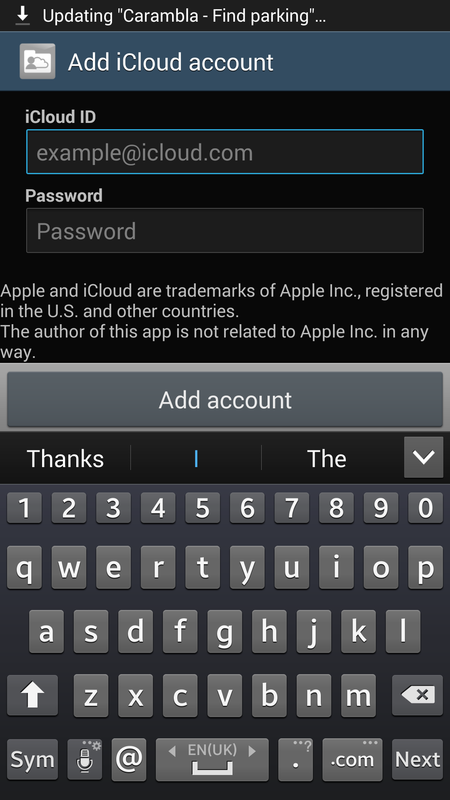 Once you press next the application will start syncing your iCloud contacts. When your contacts are synced, you can still add new contacts or edit existing ones on your Android device. The first time it should ask you if you want to ‘Complete action using Contacts or Smoothsync for Cloud Contacts‘. If you now choose Smoothsync for Cloud Contacts then any change you make and save to the contact will also get propagated to iCloud, and thus also to your Macs and iOS devices. Any changes you now make to the contacts on your Android devices will get saved on the device, but will also get updated on iCloud. Depending on the Sync settings you should see the changes appear on iCloud and later on also on your iOS and Mac devices. Changes you make on your Mac and iOS devices will also get uploaded to iCloud and will appear on your synced Android devices as well. How cool is that? And only for 3.56 euros. Of course there are some additional settings which you can access by opening the application again and picking ‘Edit account settings‘. This will give you the opportunity to set the Sync interval or even indicate if the app has to do a one-way sync only (from iCloud to your Android device but not the other way around). I have to say that Android Jelly Bean users and users of some Samsung devices might have one slight problem. They might have to re-enter their iCloud credentials every time their Android device reboots. This isn’t a bug in the application but seems to be an Android Jelly Bean bug (which hasn’t been fixed on some Samsung Android builds neither). The developer has a work-around for that! But personally, re-entering my iCloud credentials every time my Samsung Galaxy S4 reboots is no problem at all and really makes Smoothsync for Cloud Contacts a must-have app on all my Android devices. In case you are wondering how you can do the same thing for iCloud Calendars, well the developer also created Smoothsync for Cloud Calendars, which does the same thing for Calendars. All in all for about 7.12 euro (not even 10 dollars) you iCloud Contacts and Calendars will be in sync between all your iOS / Android and Mac devices. Thanks for the info about smooth sync contacts. I’m trying to find a way to sync only my Work contacts from my iCloud contacts to my Droid work phone (I have a personal iphone). I don’t want google or my droid (or my work’s IT people) to see or have access to my personal contacts on my iphone/iCloud (that’s why I can’t simply sync iCloud with Google using smooth sync because it takes all iCloud contacts not just those from Work contacts list correct?). I have a Mac computer if I need to sync through that, but. I haven’t found a solution yet. Any ideas? Well … actually no idea about that. As far as I can see, there is no way to indicate you only want certain contacts. Might be a good suggestion for the developer to allow us to sync only contacts from as pacific list. Will ALL fields on Address Book get synced? I use numerous custom fields in address book. Thank you so much for the information! I downloaded the smoothsync and after 3 weeks of going crazy because my calendars would not sync………in 5 minutes i have all appointments in my new phone! Hello: I encountered your posts by accident when searching for ways to sync contacts and calendar between my new Galaxy S III (Android 4.3) that I got as a gift, and my iMac-iPad-Ipod via iCloud. I will try to follow your instructions re SmoothSync tomorrow, but I do not know where to find, download and install the “workaround”. I am new to Google world. Although my first PC was Apple II I went then to PCs and in past past few years returned happily to Mac universe. Any help and instructions will be most appreciated. If you check the article, you will see that the Work-Around is linked in the article too. Thank you. I checked but I am not sure still how I can download this workaround. I am not a developer: just a consumer. It’s just an Android app which you install on your android phone. Open this page in your android web browser and click the workaround link. That should get you to the Google Play Store and allow you to download / install the app on your android phone. Thank you. I did it and it said “installed”. I do not see the icon for this popping up among other apps in the home screen but I guess that it must be working in the background. You probably won’t find it on your home screen, but it will be there in your list of applications. Don’t think you need to start it manually. Once I downloaded it on my S3 everything was working as it should. I’m having a slight problem brought on by replacing the Samsung Dialer and Contacts — two of the worst implementations I’ve ever experienced, on any computer or device, in any medium — with ExDialer with Contacts and Textstra (by the same author). They’re wonderful apps, very fast — but they aren’t connecting to SmoothSync. Any ideas why that might be the case? Sorry Bob, but can’t help you with that. Don’t think I’ve ever used those. I just tried it on the S5 I have here, and it worked fine. Maybe you already picked another app as the default app. You can change the default app used by going to settings -> apps -> Default Apps. Maybe you have another default set there for your contacts? Yes Stefaan, you were right! I had the deafult settings on Contacts. Thank you so much! Glad I could help Francesca. Yes, you were right! I had the deafult settings on Contacts. Thank you so much! Hi, I have a Samsung Galaxy S4, every time I turn off the phone, when I turn it on I have to put the username and password of my account in SmoothSync to sync my contacts. I haven’t found a solution yet. Any ideas? Have another look at the article, and check the workaround link mentioned. It did the trick on my Galaxy S4. Simply install the workaround app to fix it. Thank you very much. I installed the app and it works great. I purchased the app and it syncs from my iCloud to the android phone (Sony Xperia Z2) but not the other way. Are you adding the contacts to your iCloud account (using the SmoothSync to your .me account) or are you adding it to your google account ? If you add it to your google account then iCloud won’t know about it. I installed on my android S III and getting errors / not syncing / working? Did you install the Workaround app mentioned in the article? Do I automatically connect to the iCloud through SmoothSync, when I provide it my iCloud ID and PW? Or do I also have to check the Contacts box in the Systems Preference / iCloud preference pane? I found when I checked the box, yes, it worked, but I had twice as many Contact cards as unique contacts. iCloud was duplicating everything on my Mac, creating a multi-multi-MB situation. I’ve since unchecked the box because I thought SmoothSync was hooking up on its own. But as I do make changes on my Mac’s Contacts page (running under Mavericks 10.9.4), I do want them to show up on my Android phone (running Kit-Kat). So tell me precisely, please: what should be checked, unchecked, or kept separate from iCloud? And is it a natural consequence of the way things work that all my Contacts on the Mac will be duplicated? Will that be reflected on the Android phone also? …And I thought things were supposed to get simpler with Apple! Foolish me. Thank you for your help. PS The reason I’m asking is that overnight my phone apparently “lost” all of its current contacts which have been replaced by an older collection. Why would this happen? Someone on another forum said Facebook is confusing the onboard systems, so I removed FB and now even my Favorites are gone. I mean gone, off the machine, not just no longer Favorites. 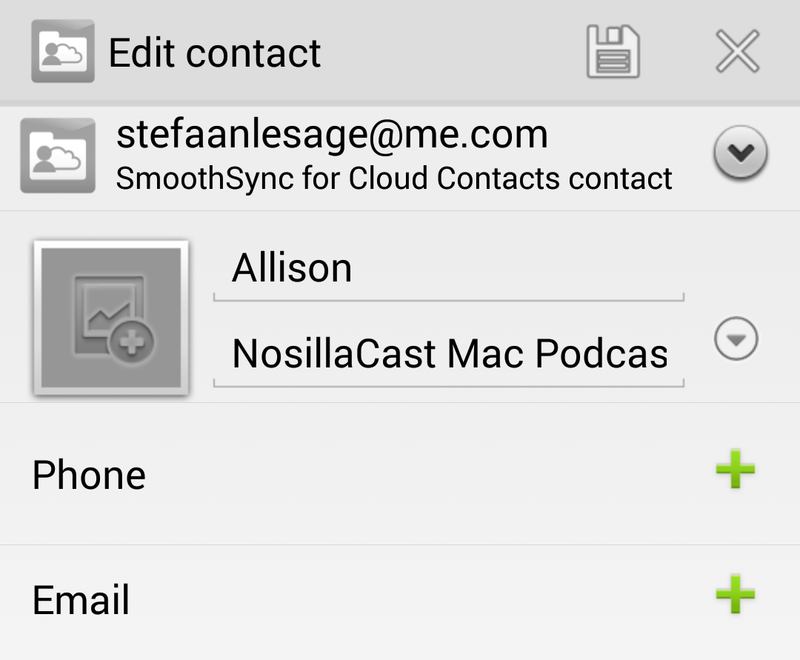 Seems all my contacts, though they bear the SmoothSync logo, are an earlier generation. What gives? Also, many, many are duplicates. I have asked SmoothSync’s author(s) for help but apparently they are booked and unable to get into it with me. So although I really liked the application when it’s working, I do have to offer caution that the relationships among the various parts of the cobbled together system are variable and there are few experts available to help out, at least online. Let me modify that: the new contacts are on my Android, but there are many duplicates associated with most of them, often bearing out of date information. Well … I believe the System Preferences / iCloud / Contacts checkbox makes sure your contacts are synced to iCloud. This is purely iCloud based so your contacts can sync with iCloud and back to other iCloud systems. I’ve used that checkbox for years now and it keeps my contacts in sync between all my Apple devices. 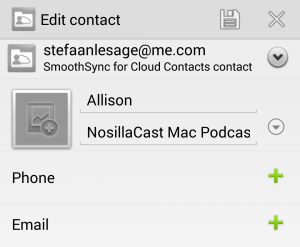 What Smoothsync does is use those iCloud contacts on your Android phone. Now of course if those contacts where already there from a Facebook sync or a google sync, you could end up with duplicaties. This is normal, since the contacts exists in different systems. On you android phone you can link contacts though. So what I did for the few duplicates is make sure they are linked. The contact then appears just once on my phone but now with a CloudSync, Google and LinkedIn icon for example. I hope this helps though, since I’m not quite sure what’s causing this issue. Well … I have no idea. Sadly I’m not the person who created the Smoothsync applications so I can’t really help you with that. On the other hand the .Mac email thing has nothing to do with Smoothsync at all. 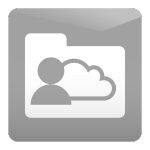 You will probably have to reenter the .Mac IMAP / SMTP settings in your android mail client.